This is the earliest known image of Flora Baum by Trego and documents the fact that Walter Emerson Baum and Flora Barndt Baum had gone to North Wales to take art instruction from Trego in 1903 and not 1904, as is sometimes reported. 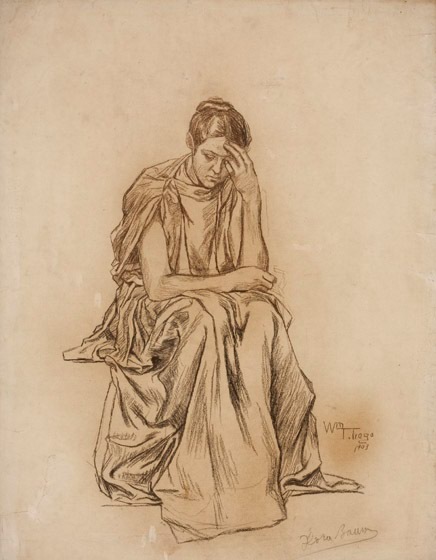 Though Flora posed several times for Trego as the mother of Jesus in various renderings of the nativity, in this sketch she does not appear to be portraying any particular personage, though she is wearing long, flowing robes of a classical or ancient design. The drawing is framed under glass and appears to be in good condition.